Millions of Tommee Tippee baby and toddler sippy cups have been recalled in the US after mould that formed in the valves was blamed for making children ill.
Mayborn USA, the manufacturer behind Tommee Tippee, is recalling more than 3 million cups after nearly 70 children reportedly became ill by drinking from cups with mouldy valves, according to the Consumer Products Safety Commission in the US. Symptoms associated with drinking from mouldy cups included diarrhoea and vomiting, and mould formed on one piece - the white valve inside the spill-proof cups when it remains wet and is infrequently cleaned. It is not yet clear if Mayborn or Tommee Tippee will also be recalling any of its products in the UK. 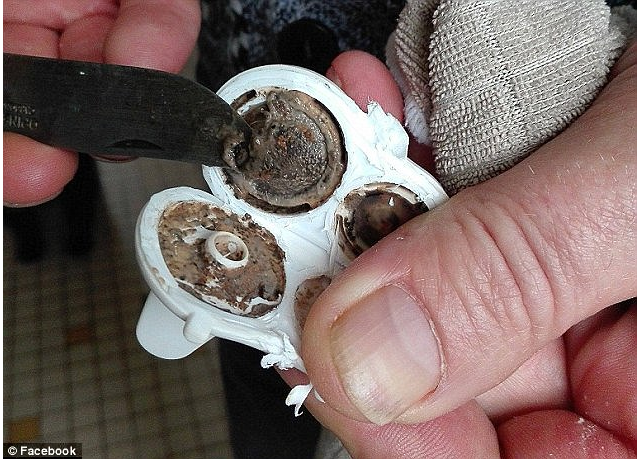 After pictures of mouldy cups were shared on social media earlier this year Tommee Tippee in the UK responded by issuing advice on cleaning the valves in the affected cups, and offered replacement clear valves so that parents could see that the cups were clean. Click here for the advice from Tommee Tippee and how to request a replacement clear valve for your cup. We will keep you informed of any changes in the advice and of any recalls in the UK should they happen. Wanting to avoid Tommee Tippee Cups? Try these: Munchkin Miracle 360 Cup*, Nuby Clik-It Easy Grip Cup (2 Pack)* just £5.99 @ Amazon or Philips Avent Baby Sip Cup* only £3.50 @ Amazon. Have any of you been affected by this issue? Let us know in the comments or on our Facebook page. These cups are terrible! Had to throw one away within a couple of weeks of getting it due to mould. - need to replace tomorrow!!!!!! Fab, thank you! We have at least 2 with the white filters shown, feel fairly sick now looking at these! My daughter has the middle bottom one and been using them over 6 months. No issues at all just a very good clean (run water threw it and bang on side). Terrible! The white part holds water inside so it's impossible to clean out properly! Had to throw my daughters out as mould is so easy to grow on these! If you call up their customer services they send you out the new clear valves and a free cup. They have been doing so for a while, I've had mine a few months now. Literally bought the bottom middle one yesterday. Although I did check it and you can remove the clear bit on it so not sure if it'll actually be a problem. We've used tommee tippee for a couple of years with no issue. Ours have the white plastic bit with removable clear valve (sounds like what you have). They're used for milk and water and I've never had a issue keeping them clean. My little boy only has one left though as the others broke (he's a thrower). I had the bottom middle one for my boys and had no issues at all. This was a while back. They've got proper cups now. Crap just bought a new one too!!! You can't beat a normal free flow beaker. No mould risk as there aren't valves. Awful we had the insulated tumbler that my toddler took to bed with his milk and the milk would turn to cheese in the valve overnight and it is absolutely impossible to clean inside. Threw it out. I had to throw mine out too. Cant clean ot properly and it stank so went in the bin! Does this apply in the UK too?! If you take them to pieces and dry them properly then no problem.... Leave anything damp and it will grow mould. Alternative is stick them in the dishwasher. Nonsense blame culture! You can't take the White valve to pieces it is moulded plastic....therefore cannot clean inside properly! The black mould is visible through valve holes when looking closely! It's actually not nonsense blame culture in this case. We have been washing and drying out the white valve perfectly every time these cups have been washed. After reading this, I decided to cut one of the White valves open ( we have no smell or illness noted), it was absolutely disgusting, black and green mould! I had absolutely no idea. Tommee tippee need to re think the design.